LONDON - Argos is to follow in the wake of Pepsi and Tic Tac by basing its summer marketing activity on ambush tactics around the FIFA World Cup. The retailer is seeking to capitalise on the interest in the tournament with a nationwide promotion called ‘World Truck', despite having no official affiliation to the event. The campaign, devised by Meteorite, introduces a front man for the brand called ‘Barry', who drives an Argos-branded ‘World Truck'. The vehicle, which will drive up and down the UK, is packed with £5000-worth of Argos goods including TVs, laptops, games consoles, barbecues, indoor and outdoor furniture and football-related products. 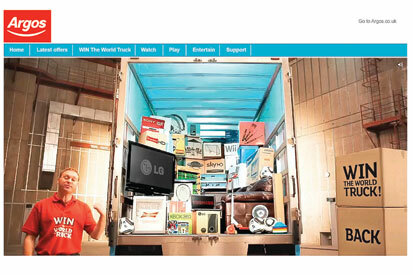 Consumers are given the chance of winning the contents of the truck on a website that underpins the campaign. Argos is aiming to appeal to families and is giving away 1000 football lessons for children. The site will be supported by activity across Argos' 700 stores, as well as affiliate, search and targeted email activity to 6.5m customers. It will also feature light-hearted videos, starring Barry, explaining the details of the promotion. In addition, there will be a series of free prize draws, where an LG HD TV will be given away every week to the consumer closest to guessing the current location of the World Truck. From 12 May, consumers will also be able to nominate a worthy cause to which the contents of another World Truck will be donated. The nominations will be promoted via viral activity and the winner will be chosen by public vote. The activity is also intended to increase conversion rates of browsers to buyers on its website, which during the 2009-10 financial year received 300m visits. Argos follows Tic Tac, Frijj and McCoy's, all of which are planning football-themed promotions around the World Cup. Pepsi has become one of the first big brands to run football-themed promotions in the run-up to the tournament. Rival Coca-Cola is an official partner of the FIFA World Cup.